A devotional’s takeaway, also called the “application,“ is the third element in the 3-part structure. (A devotional’s 3-part structure explained.) The takeaway is practical. It gives the reader an action step she can take in order to apply the devotional point. 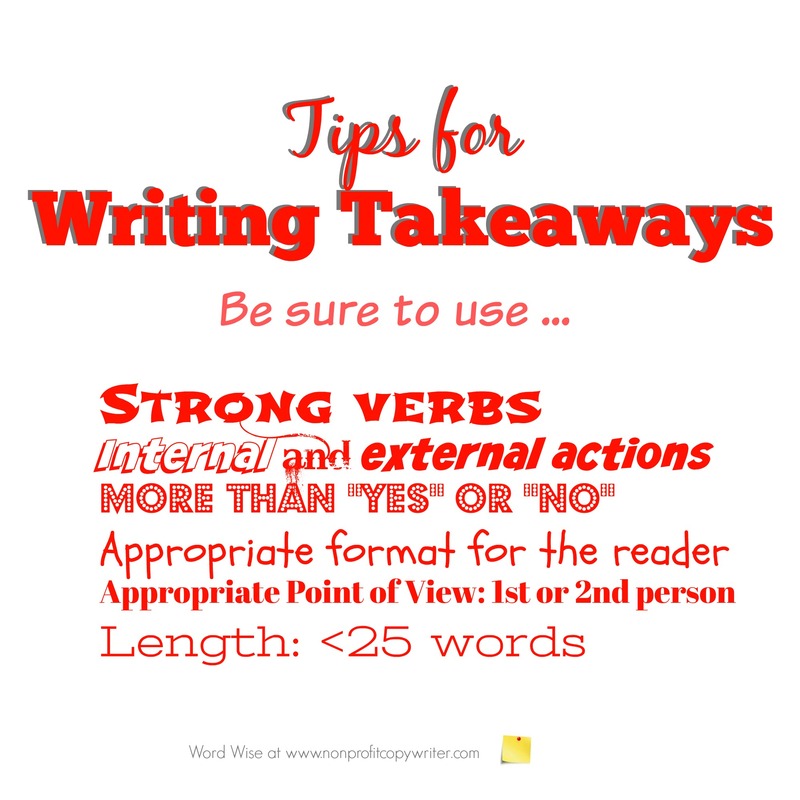 Take note of these extra tips for writing takeaways. Takeaways are framed with verbs: “a conflict to resolve” … “a promise to claim.” There is a good reason for that: verbs are action words. Your takeaway challenges the reader to action. When writing your takeaway, use action words — verbs. Takeaways can prompt external action (such as reaching out to a family member) or internal action (such as changing a thought pattern.) Action is action, whether it takes place on the outside or the inside. As you write your takeaway, do so by using open-ended questions or statements. The point is to get the reader to personalize the takeaway. If the takeaway can be answered with a simple “yes” or “no,” then re-phrase it. Extra tip: use how, what, or why to ask takeaway questions. Will you format your takeaway as a prayer? A memory verse? A task? A question to ponder? Know how the publication for which you’re writing prefers to challenge readers to take the next step. If you are publishing your own devotionals (whether in print or online), then choose how you will structure your takeaway to have the most impact for your target reader. The takeaway is usually short — about 25-50 words at most. If you’ve done a good job in the illustration section, then you won’t need more space than that to challenge the reader to action because you’ll have already made your point. All that is left is to personalize it. Which is what a takeaway should do.